Maybe you’ve heard of Snapchat. It’s an app that allows users to send photos and short videos to other users – but after a limited amount of time, the material vanishes. This feature made Snapchat notorious especially among teens, who found it easier to get away with sexting and bullying when the evidence disappeared. But Snapchat’s demographic is widening. Now moms love it too, and pretty much any female between the ages of 18 and 35. If this sounds like a good target audience for your brand, you’re in luck. 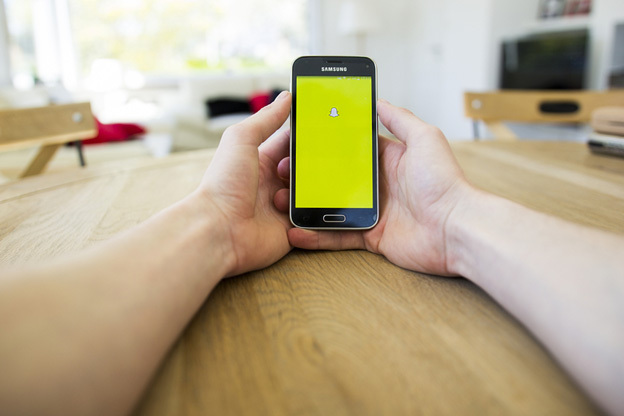 While not as well-equipped for businesses as other social media platforms, it is possible for you to establish a presence, gain visibility, and increase sales with Snapchat. Read on to learn how. First, you need to sign up with Snapchat. There is no way to set up a “business account.” Just sign up for a personal account, using your business’ name as your username. Before amassing followers, you need to plan what sort of content your business will send out. So what do Snapchat users best respond to? Snapchat users like short. Think about Twitter. Why is it so popular? Since every post is limited to 140 characters, one message takes about ten seconds to read – and that’s about all people have time and attention for. The same principle applies to Snapchat’s briefly available photos and short videos. Snapchat users like casual. The app offers silly overlays and effects that can quickly be applied to snaps. This isn’t to say that your business should be juvenile or obnoxious, but that Snapchat isn’t a place to take yourself too seriously. Snapchat users like real. They’re on Snapchat to share and participate in everyday moments with their friends, so share everyday moments. Send a snap of the front desk receptionist making a “duck face” at the camera. Or take multiple video snaps of the office talent show and make a story out of them. Snapchat users like deals. Have you ever offered a “Limited Time Only” deal to your subscribers on another media platform? Consider this: Every deal you send on Snapchat conveys a sense of urgency to its viewers. It’s not so much the fact that the deal is only available for a limited time. It’s the fact that snaps require immediate action because they will disappear. When you inform your followers of a deal via Snapchat, the very nature of the app gives it an “urgent” feel. Here’s where your business’ presence on other social media sites will come in handy: Announce your new Snapchat account on Facebook, Twitter, and any other platform you use. In order to view any material you send out, users must directly add your username. How can you get people motivated to add you on Snapchat? Give them a sneak peek of whatever type of material you plan to share. Mention that you will soon be sending a special deal exclusive to your Snapchat followers. And once you launch, keep recruiting new followers! Snapchat’s “Discover” channels are sponsored by companies who pay $50,000 per day for the privilege of sharing advertisements on them. The efficacy of these ads is debatable, but they could be a good possibility for your business. As you can see, Snapchat wasn’t designed with businesses in mind. And many business owners may glance at Snapchat and immediately decide it’s not worth the time. But for that very reason, Snapchat may be the most logical next step for your business to take.